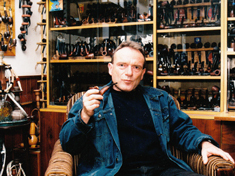 Robert Kněz, a collector and splendid competition pipe smoker is a solitaire among the Czech pipemakers. In 1990 he made his first author pipe from a briar block. He favors non-filter pipes with an ebony stem. The number of pipes such as these did not go beyond 300 pieces in total and all of them were made in a small and practical workshop he has at home. This is also one of the reasons why it is difficult to get a pipe made by Robert Kněz. Pipemaking is mostly a hobby for him, he hardly ever sells any of his pipes, mostly he makes them to make himself happy and also to make his friends happy. Sometimes he exchanges one of his pipes with another pipemaker or collector. One total exception were the competition pipes for the Czech Pipeclub for the Championship of the Czech Republic in 2010. He made the design of the pipe and working together with the factory BPK and the pipe studio of Jan Klouček he made an unprecedented series of 150 pipes. Instantly he almost doubled the total number of his production, much to the joy of Czech pipe smokers. His author pipes can be described simply. These are mostly freehand pipes that he makes in order to enrich his own pipe collection and so he tends to make unconventional and extravagant shapes. His pipes always have perfect smoking quality, based on the experiences from pipe smoking either just for pleasure or at the competitions. In conclusion it is necessary to mention his author hookah pipes, which he also manufactures, for he simply loves cool smoke.